This review is a warning, don’t invest money with Travelfina, it is a scam. 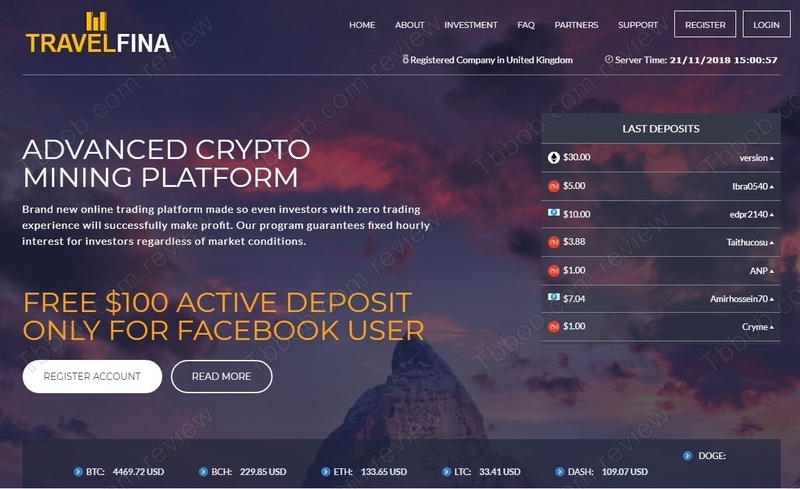 Travelfina claims to be a trading platform that allows even inexperienced people to make money. 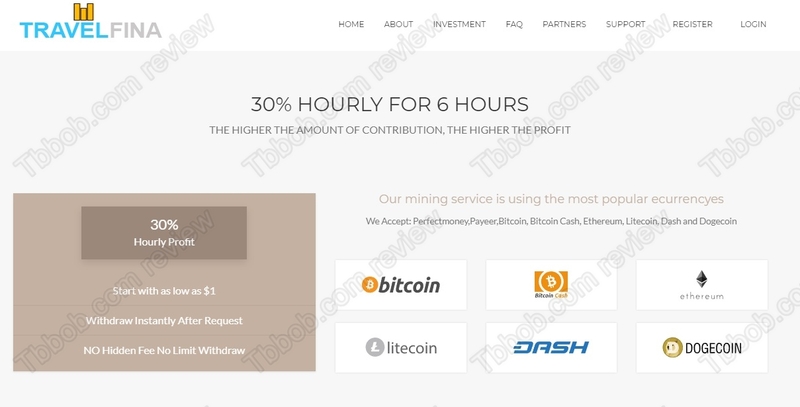 Currently the platform has only one plan with 30% profits per hour for six hours. It means that you would get 80% net profit after six hours, so theoretically 320% net per day. 320% per day is so ludicrous that everybody should see that Travelfina is a scam. There is no way to make that much money in one day, not even with cryptocurrencies, be it mining or trading. 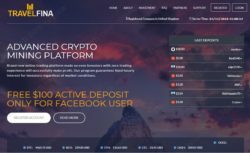 Travelfina is just one of those Ponzi schemes schemes that might pay out some profits with money they get from deposits, but it was designed to collapse soon. You cannot expect to make money in this illegal financial game, the website will close down and money will be lost. Travelfina claims to be a registered company in the UK, but it is not. The registration number they provide belongs to a company that has nothing to do with this scam. Travelfina is not a real company, there is no real business activity going on, just a scam. Travelfina is a scam, a Ponzi scheme that is going to fail soon. Stay away from it! If you are interested in real trading, first try a free demo with a regulated broker. You will see what you have to learn to be able to trade with real money and make profits. yes it’s true. I just got scammed by this website just a day ago. it’s a scam. Stay away please. Don’t invest in travelfina. Yes. for me I do not know whether I should call it a scam or mistake. I activated a security feature on their website which according to them will register only my ip Address to my account. I made a mistake and logged in elsewhere and this is the headache. They try to send me a code to disable that feature when I try logging in but their login page does not work. No. Not at all. Is sad. stay away. I just lost 500 USD to this website.